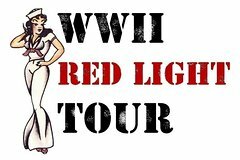 During World War II, Honolulu's red-light district was a common destination for thousands of American military men. This 90 minute historical walking tour gives you a humorous glimpse back in time to the tattoo parlors, bars, former brothels. Learn about the lusty ladies who worked in the neighborhood and about how they eventually went on strike for better living conditions! This tour features adult content and some really bad puns. Your tour guide is has been studying Chinatown history since 2013, before that she studied the history of old Seattle. Meet your small group, capped at a maximum of 12 participants, in front of the Hawaii Theatre on Bethel St in Honolulu's Chinatown. Hear tales of debauchery and corruption while you walk with your guide around the former red-light district. Our first stop is Fort St, then we will stroll down Hotel St stopping at Smith's Union Bar, Bar 35 and Old Ironside's Tattoo Parlor. After that we visit Maunakea Markets and end up at the Park at Smith and Beretania. This 90-minute tour covers just under one mile (1.6 km) and is wheelchair accessible. PLEASE let us know ahead of time if you would like us to bring a stool for someone who needs it. We are open to special requests if you would like to book a private tour, etc.